When Jan was visiting her friends, one of them made a salad out of the January issue of Bon appétit. She bought the magazine and asked for this salad for dinner. While the salad looked good, I wanted to make some changes. I do not like cooked squash, especially cold cooked squash. The original recipe called for cooking the rice in plain salted water. This seemed like a missed opportunity for flavor. I added some lemon peel and goji berries to the pot to infuse their flavors to the rice. These berries also replace the pomegranate seeds of the original. I reduced the amounts drastically. The original salad was for 8 servings and I am feeding only three. I also think that the greens are the key to the salad, not a bit player. I reversed the proportions of rice to greens. When I look at all of the changes I have made, this is another case of being inspired by a recipe, rather than adapting it. 1. About two to three hours before dinner, put the rice, lemon peel and salt into a pot. 2. Add three times the water and bring the pot to a boil. Reduce the heat, cover and simmer for 35 minutes. 3. Add the goji berries and simmer for 5 minutes more. 4. Drain the rice, but do not rinse it, and discard the lemon peels. 5. Spread the rice out on a towel covered baking tray and let it dry for 30 minutes. 6. Transfer the rice to a bowl and allow it to come to room temperature. 7. Mix the olive oil, lemon juice, honey, and pepper in a small cup. 8. Add the green onion to the rice and drizzle the dressing over all and toss well to coat. 9. Put the greens in the salad bowl and pour the rice mix over the greens. Do not mix them together. 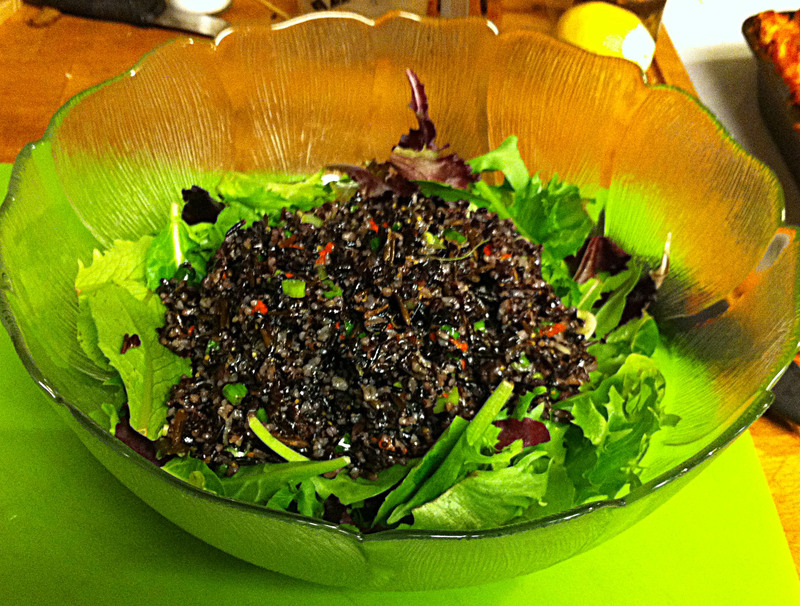 Tip: Alternatively, place the greens in individual serving bowls and put a portion of the rice on top in each bowl. 10. Lightly toast the pecan pieces. 11. Serve with the pecans on the side as garnish. Tip: Or sprinkle over the individual salads.